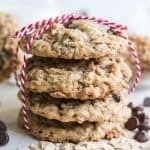 Toffee Oatmeal Chocolate Chip Cookies are hands down the best oatmeal cookie variation there is! Perfectly balanced flavors with caramelized toffee bits and milk chocolate, and always soft & chewy on the inside while barely crisp around the edges. These cookies are impossible to resist! Heat oven to 350 degrees. Line a large baking sheet with parchment paper. In a large bowl, beat the butter and brown sugar together until creamy. Add the eggs and vanilla and beat again, scraping sides of bowl as needed, until combined. Add the flour, baking soda, baking powder, and salt, stirring just to combine. Mix in oatmeal, toffee bits, and milk chocolate chips. Drop dough by rounded spoonfuls onto the prepared baking sheet. I prefer making these cookies extra large with my cookie scoop, which is about 2 tablespoons of dough per cookie. Bake for 12-14 minutes (if making large cookies) or 8-10 minutes (if you are making smaller ones, just until light golden brown around the edges. I prefer to underbake slightly for a chewier, softer cookie. Cool cookies on the baking sheet for a few minutes before transferring to wire racks to cool completely.